On an unspecified Saturday afternoon in September 1944, a Dutch Jew was hanged before a crowd of thousands in Blechhammer, a Nazi forced-labor camp that was a subcamp of Monowitz, which was in turn a subcamp of Auschwitz. 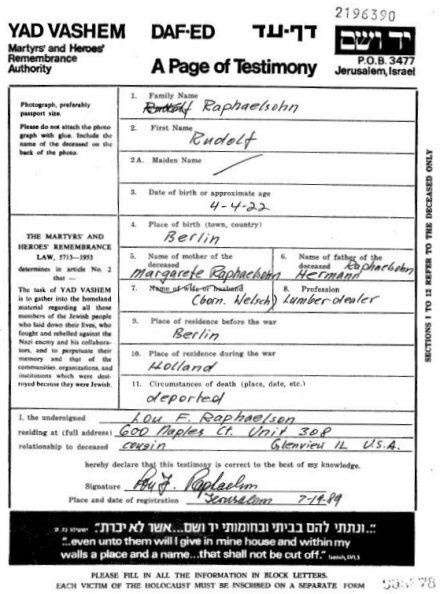 Yad Vashem’s Central Database of Shoah Victims’ Names includes an entry for a Rudolf Israel Raphaelsohn that seems to fit: he was born in Berlin in 1922, spent the war in the Netherlands, and perished in Blechhammer in 1944. His individual page of testimony describes his occupation as “sawmill owner.” This is probably, but not definitely, our man. Rosengarten wrote about Raphaelson’s execution in his book Survival: The Story of a Sixteen-Year-Old Jewish Boy, published in 1999. According to him, Raphaelson was a Kapo, meaning he had certain privileges and a position of leadership over other Jews in the camp, sort of like a prison trusty. He met his death through sheer bad luck. This Kapo had seen a bomb lying on the ground, which had not exploded. It was split open, but the mechanism had not detonated. The Kapo saw a yellow powder lying in the middle of the split bomb. He obviously did not realize it was dynamite. Because we had no washing powder in the camp, he got the idea of smuggling some of that yellow powder into the camp in a parcel to see if it could be used as a washing powder. While he was busy taking the powder in, he was caught by an SS man. He was whipped until he fell down. Next, when he came into the camp he was sent to the Politische Abteilung. The SS of the political department drew up a protocol in which it was stated that Raphaelson … had “plundered” the dynamite and that he had done it with the intention of committing “sabotage.” His deed was stamped as a “terror against the Third Reich.” Raphaelson was then forced to sign the statement. And then … the SS let him go. He was not relieved of his position as Kapo. He was not transferred to a punishment detail. A whole four weeks passed by and the incident was never mentioned, and the inmates, who had enough to worry about in their difficult day-to-day existence, forgot all about it. Raphaelson’s execution took everyone completely by surprise. Everyone came back to camp after a hard day’s work and noticed the SS were all in dress uniform and parading them around as if some important holiday was being celebrated. The inmates weren’t allowed to go to their barracks as normal. Instead they were assembled in the center of camp, where a gallows had been set up. After a very long wait, the stool was pushed away from under his feet with a firm kick. A panicked chill passed through us as if time were falling away. But then it seemed the rope was not holding. Suddenly, it broke in two. Raphaelson fell unhurt to the ground. Everybody present stood amazed. We all hoped now that Raphaelson would be given mercy because of that unusual event. But such a thing was, of course, unthinkable for the SS. The rope was repaired and once again the boy was placed on the stool. Again it was kicked away. But the unbelieveable happened again! The rope broke in two a second time! A sort of providence seemed to have insinuated itself. Everything we saw was so unusual, so unreal! But the Nazis did not give up. For the third time, the Kapo was placed upon the stool, and the noose was put around his neck. Because of what had happened, Raphaelson came more and more to his senses. He seemed to be more clearly aware of what was going on. All of the sudden he yelled, “Friends! Do not lose courage! Those who today want to murder us will themselves soon be kaput!” The two SS who stood next to him could not believe what they were hearing. “Hold your beak, you!” they shouted. Quickly they again kicked the stool away. And then Raphaelson sank down. For a couple of long minutes we had to look him in the eyes. After that, he was no longer among the living. Israel Rosengarten survived several concentration camps and death marches before he was liberated in Buchenwald on April 11, 1945. By then, he was near death from starvation and exhaustion. After he recovered his health he went home to Belgium and discovered he was, at eighteen years of age, the sole survivor of his large family.